The conclusive, never-before-told story of the prep-to-pro generation, those basketball prodigies who from 1995 to 2005 made the dive directly from high school to the NBA. When Kevin Garnett shocked the world by revealing that he would not be attending college-- as young basketball prodigies were anticipated to do-- but instead enter the 1995 NBA draft directly from high school, he blazed a trail for a generation of teenage basketball players to head directly for the pros. That trend would continue till the NBA set up an age limitation in 2005, requiring all players to participate in college or another developmental program for at least one year. Over that decade-plus period, the list of players who made that tough leap consists of a few of the most renowned players of the contemporary period-- Garnett, Kobe Bryant, LeBron James, Dwight Howard, Tracy McGrady, and various other stars. It likewise consists of noteworthy "busts" who either physically or psychologically proved not able to manage the shift. For better or for worse, the face of the NBA was permanently altered by the prep-to-pro generation. In engaging, masterfully crafted prose, Boys Amongst Mengoes behind the scenes and draws on hundreds of direct interviews to paint informative and appealing portraits of the most essential figures and events throughout this time. Acclaimed basketball writer Jonathan Abrams has actually gotten exceptional access to the crucial players, coaches, and other movers and shakers from that time, and the result is a book packed with uncommon insights and never-before-published information about this chapter in NBA history. 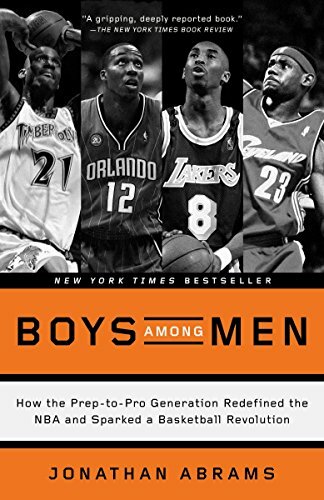 Young boys Amongst Guyis a thrilling, useful, must-read for any basketball fan.